UNITED NATIONS, October 3 -- On Myanmar, the word in the UN for a week has been, "Wait until we hear from Ibrahim Gambari," the envoy who went and spoke with strongman General Than Shwe and with detained democracy leader Aung San Suu Kyi. But now that Gambari is arriving, it appears that those who get to hear him may be restricted. He will first report privately on Friday to Secretary-General Ban Ki-moon and General Assembly President Srgjan Kerim. It had been assumed that the main event, Gambari's reporting to the Security Council, would be at least partially conducted in open session, so that other countries and, not least, the public through the press could attend. But in a closed door Council meeting on Wednesday, an argument was made that Gambari's briefing should be held entirely in secret. The main proponent of secrecy was by one diplomat of a Permanent Five Council member described as a country soon holding an Olympics -- that is, China -- and quoted as justifying the proposed news blackout as a product of Mr. Gambari being "tired." That would be the jetlag heard -- or not heard -- around the world. Inner City Press asked Council president Leslie K. Christian if any portion of Friday's report by Gambari on Myanmar will be public; he said it is too early to say. Video here. The UN's resident coordinator in Myanmar, Charles Petrie, was quoted by BBC Radio on Wednesday morning that UN staff had been swept up by the government and that it "might impact on our operations, you might argue." The mildness of the rebuke can be contrasted, at least initially, with the response to the taking hostage of Nepali UN peacekeepers in the Congo last summer. Then Secretary-General Kofi Annan, asked about it by Inner City Press, said that there would be no impunity for the those who seized the peacekeepers. The Council and its members also spoke on the topic. In this case, a Council diplomat who participated in Wednesday's closed-door consultations said that the seized UN staff were not discussed. Inner City Press at Wednesday's noon briefing asked the UN's spokesperson about this case. 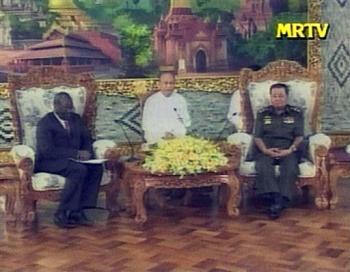 She confirmed they had been taken, and added only that a letter will be sent to Myanmar's mission to the UN. There's not even the fleeting promise of no impunity. Impunity is prevailing -- possibly entirely in secret. Developing.